The Drum Corps Europe (DCE) Championships start this Saturday, Sept. 23, in Rotterdam, the Netherlands. More than 20 European corps from the United Kingdom, the Netherlands, Germany, Sweden and Belgium are scheduled to perform in the one-day event. More than 2,000 visitors from Europe, Indonesia and the United States are expected to attend. Drum Corps International Executive Director Dan Acheson will be in attendance in Rotterdam at the event. Jubal from the Netherlands performed in the U.S. this August at the DCI World Championships. 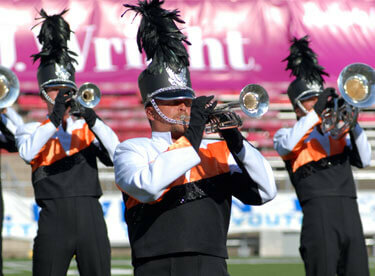 The corps will compete in Rotterdam this Saturday. "I am really looking forward to attending the 2006 Drum Corps Europe Championships not only as a representative of Drum Corps International and its member corps, but also as a huge fan of drum corps. I'm expecting to see great performances during my visit to Rotterdam," Acheson said. Look for upcoming reports from Acheson's trip in the coming week on DCI.org.